The traditional formal distinguish ascot gray striped tie for very formal occasions. This costume accessory can be used for many many shows, periods and events. Chekhov, My Fair Lady, Importance of Being Ernest, butlers, etc., etc. 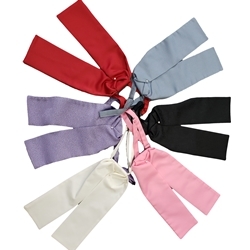 Available in assorted patterns/colors - Bright Colors, Cream/Whites, Gray/Blacks, Pastel Colors.